A knife-wielding robber who terrified a teenage shop worker has been jailed along with his former girlfriend and getaway driver. Judge Stephen Fowler QC told Peter Nichol and Lindsay Beattie that small newsagents, often with young staff, were a known vulnerable target and the courts have always called for “condign punishments” to deter others. Nichol aged 23, from Dunavon Heights, Dungannon, was given three years for the actual robbery of £710 on March 27 last year, and Beattie, a 41-year-old mother of three, from Altmore Drive in the town, received two years for assisting an offender. Judge Fowler said that as a result of the robbery the 16-year-old schoolboy has since been unable to work such was the “shock and upset” he suffered in what was his first part-time job. “It was no doubt a frightening experience for this young man,” the judge told Nichol, while acknowledging his guilty plea was “very welcome” and would attract considerable credit. Judge Fowler told Beattie she was much older, and “should have known better” than to have assisted Nichol “in this enterprise”. Prosecution counsel Michael McAleer had earlier told Dungannon Crown Court that after the robbery, the couple, who have since broken off their affair, were later arrested outside another shop in the Co Tyrone town. 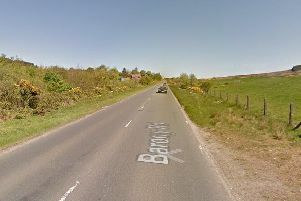 Mr McAleer explained that as Nichol and Beattie made their escape in her black Mini, part of the number plate was noted, which was circulated by police. Defence lawyer Richard McConkey said the “amateurish” robbery was carried out at a time when Nichol had a number of addiction issues, but he had since “pulled himself together considerably”. Counsel for Beattie, Liam McStay, explained she has had a traumatic lifestyle and accepts there was a relationship with the co-accused, “which they allowed to cloud their judgment”. Both Nichol and Beattie will serve half of their sentences in custody followed by a similar period on supervised parole.